From other contemporary pictorial skits by Seymour we learn that various changes were made in the royal establishment, and the new queen seems to have addressed herself specially to a reform in the dresses of the court domestics. 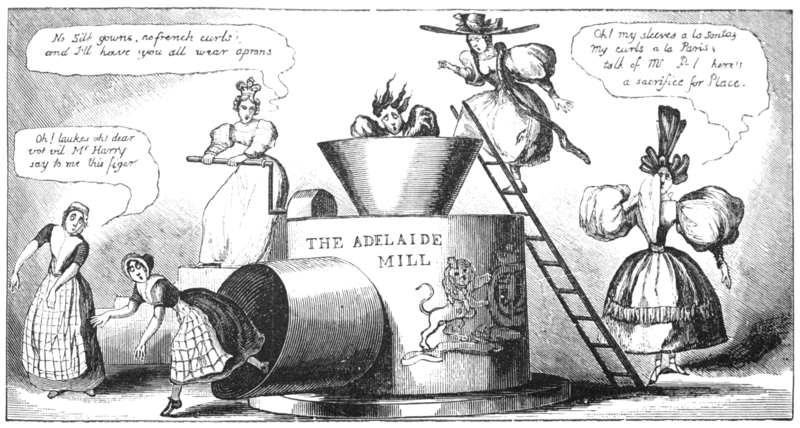 On the 1st of October, 1830, Seymour represents her grinding an enormous machine, called the “Adelaide Mill,” into which the women servants, dressed in the outrageous head-gear and leg-of-mutton sleeves of the period, are perforce ascending, and issuing from the other side attired in plain and more suitable apparel. “No silk gowns,” says Her Majesty as she turns the handle. “No French curls; and I’ll have you all wear aprons.” The new queen seems also to have shown a disposition to encourage native manufactures and produce at the expense of French and continental importations. These changes were not particularly pleasing to the Conservative lady patronesses of Almack’s, who were celebrated at this time for their capricious exclusiveness.